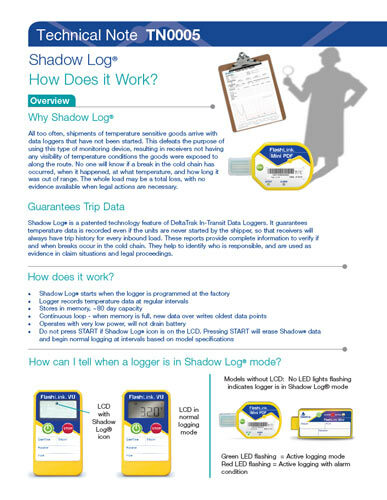 Our next generation plug-and-play logger has the added benefit of Shadow Log® technology, guaranteeing that receivers always get trip data, even if a shipper forgets to start the unit. This compact, single-use temperature recorder has a built-in USB connector and on-board software, making it ideal for export shipments. Receivers across the globe can quickly and easily download recorded trip history without special reading devices or installing software. PDF and CSV reports are automatically generated with both °F and °C scales, including a graph, summary analytics and tabular data. Files are conveniently shared, printed and saved from a PC, tablet or smart phone with adapter and compatible Adobe Reader application. One model is suitable for domestic routes and import/export operations, for all modes of transportation: air, truck, rail or ocean container. 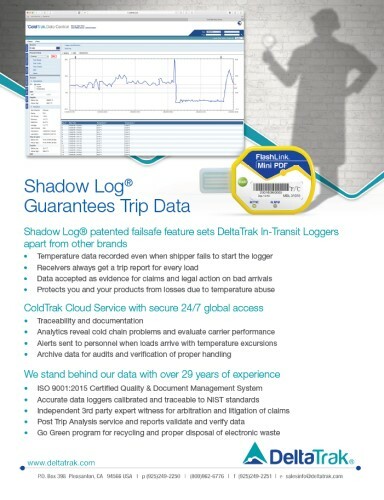 Shippers simplify logger inventory management without having to stock multiple models of various logging durations. 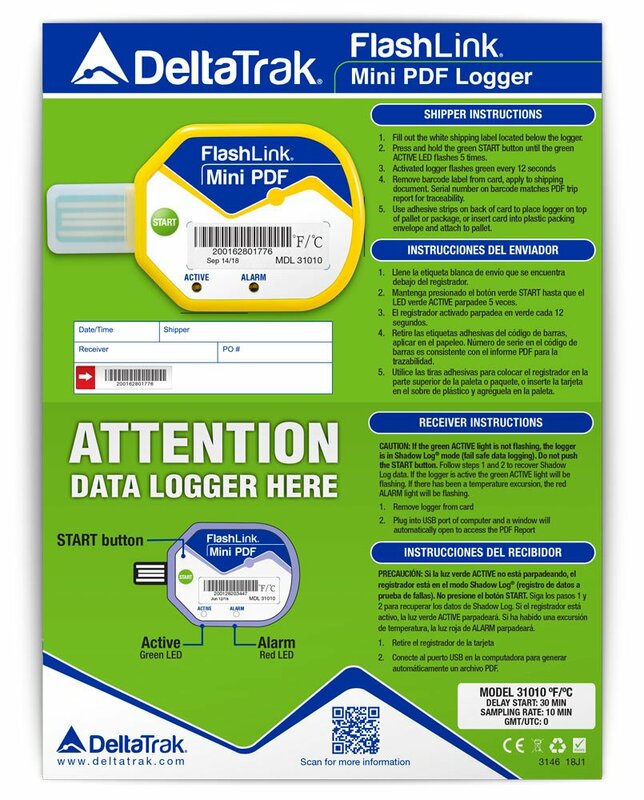 Recorded data is scaled to fit a graph on a one-page PDF report, which means shorter logging periods are shown with high resolution as a full graph. 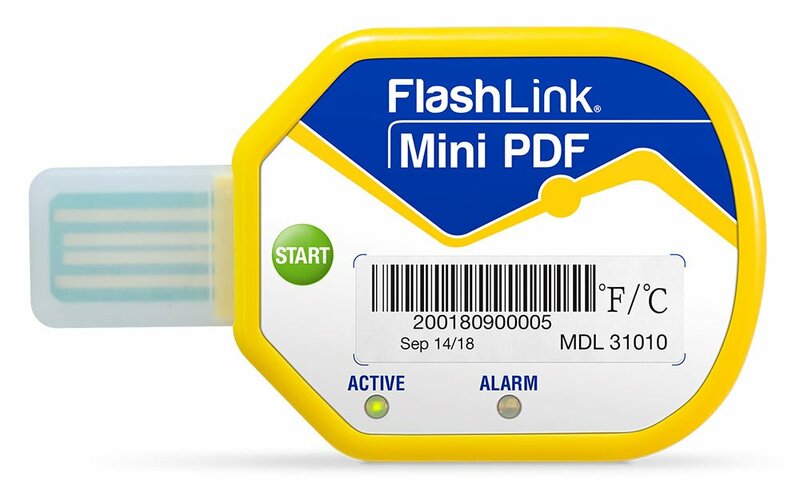 Each FlashLink® Mini PDF In-Transit Logger is mounted on a bright green shipping card, making it easy to find when a load arrives. 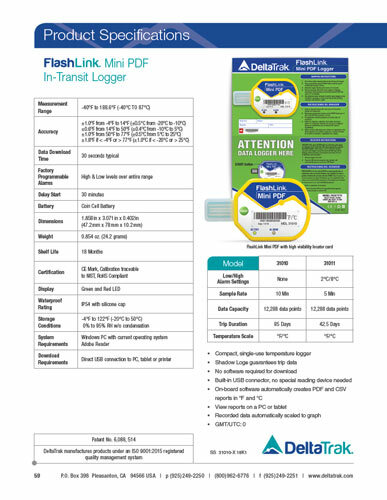 The card has an area for documenting shipping information and features a peel-away barcode label that can be attached to the bill of lading or other shipping documents, for traceability. It also provides shipper and receiver instructions in English, Spanish and Chinese. Users can scan the QR code to quickly access more information from a URL, including the User Guide and FAQs.